With industrialization came the need for greater sources of power which, in turn, spurred on an increase in coal mining . 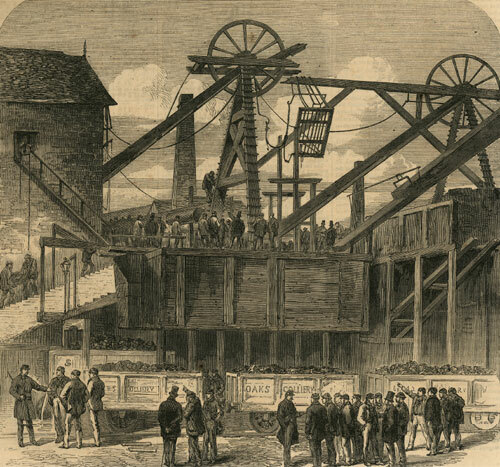 The West Riding was rich in coal fields which helped to fuel the growth of industrialization in the area. Coal mining has always been a dangerous occupation with cave in and explosions a constant hazard. 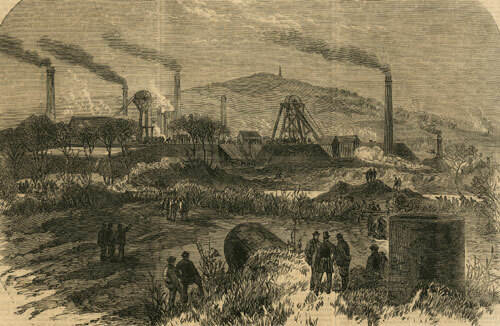 At Oak Colliery near Barnsley there was a gas explosion in December 1866 which killed 321 men and boys. This was followed the next day by a second explosion which killed 28 more men. The dead on the second day included several of the mine's managers who had volunteered to help search. While the management claimed that gunpowder was never used in getting the coal it was used in a "new drift in the stone bind " and it had been used on the day of the first explosion about 80 yards from the pit bottom. There had also been an explosion at Talk o'the Hill colliery at Kidsgrove in Staffordshire on the 13th of December, 1866 which resulted in 91 deaths. All the bodies were recovered. "in order to enable the sufferers to spend as comfortable a Christmas as possible, have distributed 4 lb. of meat to each widow and 1 lb. to each child." 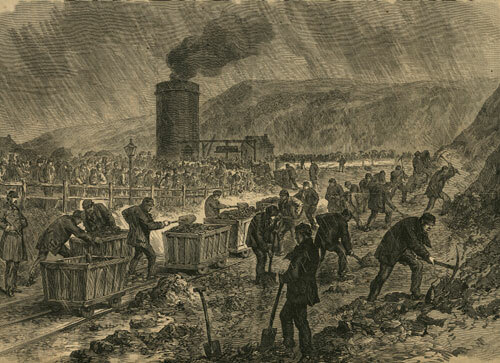 There had already been a disaster at Barnsley in 1847 when 73 people died in a mine explosion. The 1866 incident was the worst disaster in mining in the 19th century. There were 55 miles of mine tunnel in the mine and the pit was 285 feet deep. 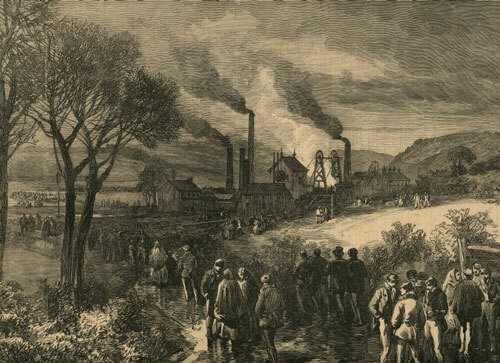 With Christmas approaching most miners were at work on the afternoon of December 12 when the first explosion occurred. The explosion destroyed the cages so it was hard to get the miners out. Over the next few days there continued to be explosions and because of the extreme danger it was decided to seal the mine and abandon the dead inside it. Barnsley is located several miles south of Wakefield. Young boys, girls and women were employed in the mines because they could reach into places that a full grown man could not. However, child labor was rampant all over the world in the mid 1800s. Until 1842, women and girls, and children as young as from six to eight years of age, were employed underground in Yorkshire coal mines, but in that year an Act of Parliament was passed, prohibiting all women and girls from underground work, as well as boys below the years of age. 1842 legislation barred women and girls from pulling tubs in the mines and restricted work done by boys. Pit ponies had been used before this time but this legislation greatly increased the use of the pit pony. Pony driving was unskilled labor. Pony drivers were usually males under 21 year of age and it was frequently a first step to working in the mines. Wages for pony drivers were substantially less than for jobs working the coalface. A driver generally worked with the same pony all the time and was responsible for him during the shift. The ponies were really horses or sometimes mules - not ponies per se. They were generally male. They were stabled under ground and only came to the surface for annual holidays and during strikes. Sometimes they were taken to the surface for a periodic rest. The horses were introduced to the mines unschooled at about the age of 4 or 5 years. They were usually blindfolded when taken into the mines. Their working life span was about 10 years. The horses wore helmets for protection. Horses would pull 3 to 4 tubs and generally could not be coerced into pulling more. There was a horse keeper who was responsible to the general care and well-being of the horses. He fed and groomed them. He also assigned the ponies to the driver. This is a job that would have required writing. Horse keeper was a step up from driver but still did not pay as well as working the coalface. Although it did pay better than being a horse keeper on a farm. Top rung in this occupation was head horse keeper. In order to stem the spread of the resulting fire in the mine, the shaft had to be filled with earth to stop the draught of air. This illustration show workers digging and bringing dirt to the shaft.